Tales from the Chinese Zodiac is a new series of twelve (of course) full-color illustrated children’s books, each written by Oliver Chin and all of them published by Immedium. 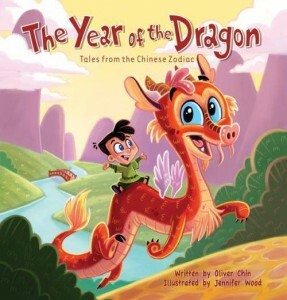 In each book we meet on of the animals of the Chinese Zodiac (dog, pig, rat, monkey, etc.) as a youngster, and each of them must learn how to represent their aspect of the zodiac as he or she grows to adulthood. Illustrators for the series include Jeremiah Alcorn, Justin Roth, and Jennifer Wood. Your ever-lovin’ ed-otter especially liked The Year of the Dragon (illustrated by Ms. Wood, and reviewed here on Book Dragon, of course). Not only because 2012 is one, but also because it’s his Chinese Zodiac sign!